Ginsburg"has gone missing and may be dead or still in NY hospital, missing two weeks of oral arguments at the Supreme Court, or the entire month of January, with no proof of life, setting the stage for U.S. President Donald Trump to name another Justice,"Pentagon sources say. Jim Yong Kim, a Clinton appointee, was forced to resign as President of the World Bank because of corruption, say Dragon family sources. Investigators are focusing in particular on Haiti and Kim's involvement with Clinton corruption related to the artificially induced 2010 Haiti earthquake, CIA sources say. Serena Rothschild was the widow (or wife) of senior Zionist elder Baron Jacob Rothschild and mother of Nathaniel Rothschild. All we know is that she died"after a short illness." We have reported that Jacob Rothschild is already dead, but it appears that attempts are being made to make it seem he is still alive in order to prevent his progressive-minded son Nathaniel from taking over the British branch of this still-powerful family. KKR and and their employee General David"betray us"Petraeus are being charged in the ongoing U.S. military tribunals for their role in creating and arming Daesh (we don't want to insult the Goddess by calling them ISIS), the sources say. KKR public relations had not responded to a query on this matter by the time this newsletter went public. The move to arrest Shinzo Abe will take longer, but preliminary work has begun as French police have indicted Tsunekazu Takeda, president of Japan's Olympic Committee, on bribery charges. While this can be seen as French retaliation for the arrest and mistreatment of former Nissan president Carlos Ghosn, there's more to the story. According to Japanese right-wing sources, Takeda is a member of the Japanese imperial family and was involved in Japan's getting the 2020 Olympics as a reward for going along with the March 11, 2011 Fukushima tsunami and nuclear mass-murder attack. Abe, his cabinet, and the Iwasaki Mitsubishi clan will all be taken down as a result of their complicity with this mass murder, the sources say. Theresa May is being removed for her role in trying to sabotage Brexit and hand over control of British intelligence to the gangster families that control the EU, according to MI6 sources. 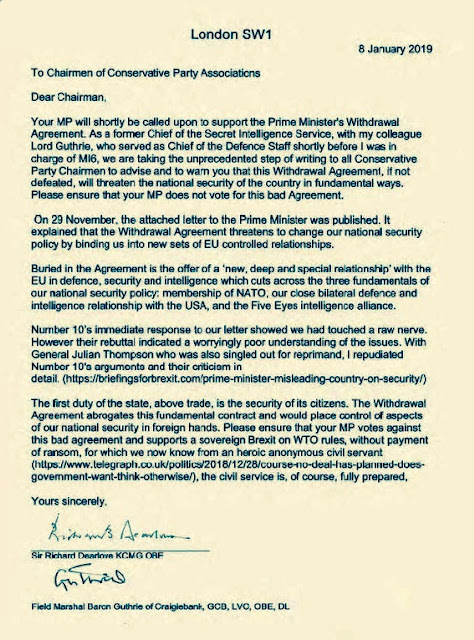 The letter below was sent by the former head of British Intelligence to MPs to warn them of May's treason. Speaking of evidence trails, forensic accountant Kenneth Boyd has looked into how people like Trump's Commerce Secretary Wilbur Ross, Treasury Secretary Steven Mnuchin, Prince Charles, former UK Finance Minister James Sassoon, as well as various mega-corporations use offshore tax havens to avoid taxes that the rest us are forced to pay. The dragnet is also closing in on the rogue state of Israel and their satan-worshiping and criminally indicted Prime Minister Benjamin Netanyahu, the Pentagon sources say. On that front, the big kahuna, 911, is being taken on. Trump's speech on January 8th was exactly 9 minutes and 11 seconds long. This is a prelude to Trump declaring a national emergency and releasing all the 911 files, the sources say. Furthermore, the global boycott of Israel is intensifying as"as HSBC Bank divests from Israeli arms merchant Elbit Systems, Airbnb bans West Bank listings, and Brazil may not move its embassy to Jerusalem,"the sources say. Netanyahu's neocon slave boy John Bolton"got his wings clipped"by Turkish President Recep Erdoğan and top U.S. General Joseph Dunford when he tried last week to stop the U.S. military withdrawal from Syria, they add. With the U.S. government now shut down for the fourth consecutive week and no end in sight, the whole world can see that the days of the U.S. Corporation are numbered. Dmitry Rogozin, the head of the Russian Roscosmos State Space Corporation, cancelled his planned February visit to NASA ("not a space agency"), because the"second American civil war"is under way. Also, the fact that NASA's money has been cut off by the shutdown was undoubtedly a factor in the cancelled visit. The Chinese"One Belt One Road"project, 60 times bigger than the Marshall Plan, is an example of the type of project the West also needs to start. When the old-guard elite meet at their Davos lovefest on February 22nd, let's see if they offer anything that even comes close to the WDS plan to spend trillions of dollars per year to help save the planet. If not, then it's time to remove their control over the financial system. Humanity needs to be free to create an ideal future for our plan.